The Servant is one of my favourite and most memorable films of its time. It is as dark and twisted as it is unique, an upstairs downstairs tale that takes a dark psychological turn in swinging 60s London, as agendas are revealed and the balance of power between two men cruelly shifts. 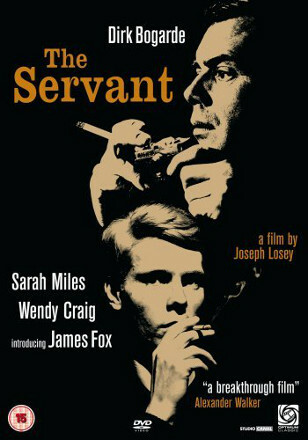 The Servant is a timeless classic and the first of three films born out of a great cinematic partnership - with Joseph Losey directing and Harold Pinter writing. In terms of talent it rarely gets as great at The Servant - Losey directing a screenplay written by Pinter adapting a book by Robin Maugham with James Fox, Dirk Bogarde and Sarah Miles in lead roles. After The Servant, Losey and Pinter went on to make Accident and The Go-Between as well as Pinter contributed to Losey's 1966 comedic Modesty Blaise. The Servant engages with its audience as one is never sure of the next turn it could take or how far one man could fall as the true nature of the men reveals itself. The Servant has moments of despair as well as poignantly touching hints at hope to push you to the other extreme. Brilliantly played out by the legendary James Fox and Dirk Bogarde who are the living embodiment of the men they are portraying. As well as the digitally restored 50th Anniversary big screen re-release in selected cinemas from this Friday March 22 the restored The Servant will be released onto DVD, Blu-ray and EST on 8 April, 2013. 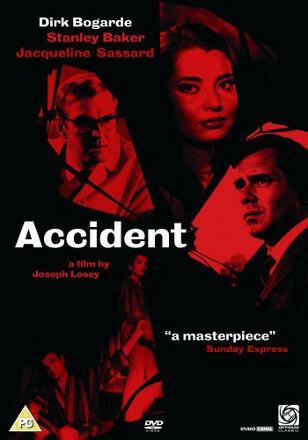 Studio Canal will also be releasing the second collaboration between Joseph Losey and Harold Pinter - Accident onto DVD, Blu-ray and EST on the same day 8 April, 2013. Join the Curzon Mayfair for a special screening of Joseph Losey’s The Servant, which marked the start of what became one of the most potent creative partnerships of British 1960s cinema. Losey and acclaimed playwright-turned-screenwriter Harold Pinter united to create a disturbing tale of seduction, sexual and social tension and psychological control. Acclaimed director/actor Richard Ayoade (Submarine, The IT Crowd) will introduce the screening, which will be followed by a post-screening discussion with cast members James Fox, Wendy Craig and Sarah Miles. The discussion will be moderated by Guardian film critic Peter Bradshaw. A tale of manipulation, class conflict and sexual jealousy, Joseph Losey’s classic, adapted by Harold Pinter from Robin Maugham’s novel, is one of the finest British films of the 1960s. Dirk Bogarde plays Hugo, a manservant recently employed by a bored aristocrat (James Fox). Surly at best, Hugo gradually takes over the house, reducing his master to a state of complete submission. Pinter’s sparse dialogue allows Losey to create a taut, unsettling psychological drama. 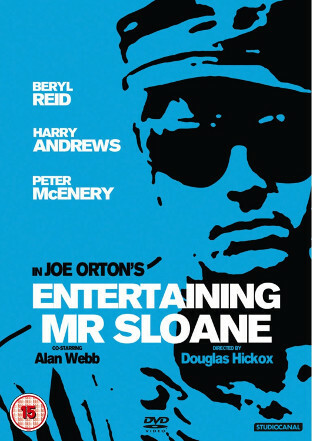 A deliciously dark and humorous story about manipulation and repressed sexuality from controversial playwright Joe Orton. An attractive young charmer by the name of Mr. Sloane weasels his way into the lives of a middle-aged brother and sister, while trying to disguise the truth about his unpleasant past. Sexual tension drives the plot from the very beginning, when the lonely Kath (Beryl Reid) spots Mr. Sloane (Peter McEnery) in a cemetery and invites him to become a boarder. Despite the age difference, Sloane coyly plays along with her flirtations for his own benefit. Their fun seems over when Kath's brother Ed (Harry Andrews) shows up, but the prim and proper gentleman also takes a shine to Sloane, hiring him as his chauffeur and taking particular interest in the young man's tight leather uniform. Kath and Ed's elderly father, however, develops a strong hatred of Sloane, and accuses to him of being involved in an old, unsolved murder.